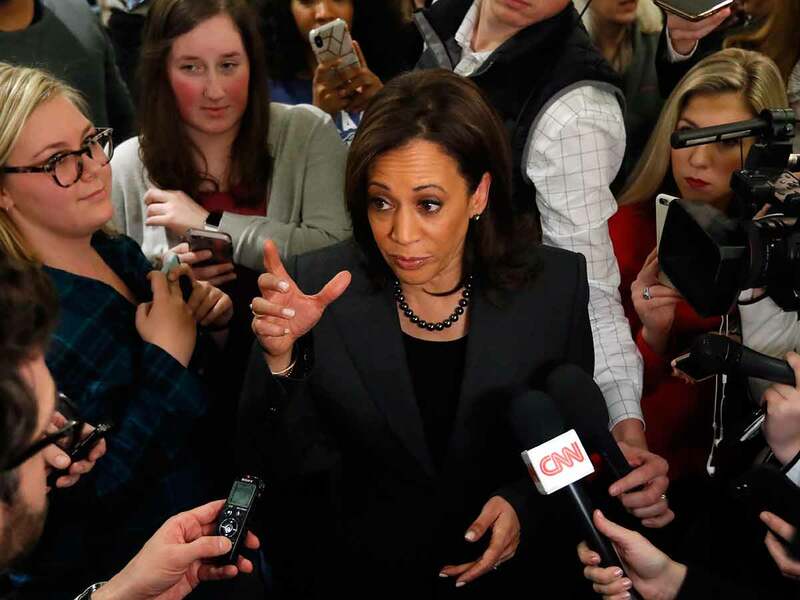 WASHINGTON: US Senator Kamala Harris faces questions from American voters Monday as an official White House candidate, a day after formally declaring her 2020 bid to become America's first black female president. By launching her campaign early - a year before any primary votes are cast - the California Democrat leapfrogs several party luminaries waiting in the wings, and a few who have already entered the race, to become the de facto frontrunner in a burgeoning field that may ultimately feature dozens of candidates seeking to oust President Donald Trump. She takes her campaign immediately to Iowa, the state that votes first in the nominating process, where she holds a televised town hall from Des Moines that airs at 9:00 pm Monday (0300 GMT Tuesday). But complicating Harris's launch in Oakland, where a crowd of more than 20,000 watched her kick off her campaign Sunday, billionaire former Starbucks chief executive Howard Schultz said hours later that he is seriously considering jumping into the race - as an independent. The American dream and our American democracy are under attack and on the line like never before. The self-described "lifelong Democrat" told CBS news show "60 Minutes" that he "will run as a centrist independent outside of the two-party system." Not only is Trump not qualified to be president, he said, but Republicans and Democrats failing the American people by engaging daily in "revenge politics." Schultz's announcement drew sharp rebukes from Democrats who warned he would siphon off Democratic votes and clear Trump's path to re-election. "If he ran it would be the best thing possible for Donald Trump," tweeted congressman Brendan Boyle. "I urge him, for the good of the country, to reconsider this bad idea." Trump himself wasted little time going after Schultz, taking to Twitter to declare the coffee king "doesn't have the 'guts' to run for President!" Harris, 54, and Schultz, 65, join several candidate already in the race, including Senator Elizabeth Warren of Massachusetts, New York's Senator Kirsten Gillibrand, House Democrat Tulsi Gabbard of Hawaii, and Obama-era housing secretary Julian Castro of Texas. The compelling Oakland speech was a show of strength by Harris and most likely a calculated shot across the bows to those still on the 2020 sidelines, notably the four B's mulling a run: Joe Biden, Bernie Sanders, Cory Booker and Beto O'Rourke. She spoke of the "arrogance of power" demonstrated by Trump and his administration, and warned that "the American dream and our American democracy are under attack and on the line like never before." "We must answer a fundamental question: Who are we?" she said. "America, we are better than this." Harris, whose father is from Jamaica and whose mother is Indian, said that "in the face of powerful forces trying to sow hate and division among us, the truth is that as Americans, we have so much more in common than what separates us." For years California - the nation's most populous state - voted near the end of the process, meaning nominees were often decided before a single Californian cast a vote. But the state has moved its primary forward, to so-called "Super Tuesday" on March 3, 2020, which would give The Golden State a dramatically more powerful say in determining the nominee. One prominent Californian, outspoken congressman Ted Lieu, has already endorsed Harris, describing her as "the person we need to move America forward." Harris is a former state attorney general. On Sunday she announced her platform will include several progressive policies like debt-free college and "Medicare for all," which would allow Americans to opt into government-run health coverage.